Pool Troopers wants you to be smart when it comes to water chemicals that are used to treat your pool. Used extensively in pools to fight the growth of bacteria and algae, chlorine has been shown to both sanitize and oxidize pool water. Some side effects are that it is also known to dry out hair and skin. Chemicals such as chlorine and bromine are added regularly to treat pools for microbes that might potentially cause sickness. Her studies show that there is more danger from the combination of chlorine with other chemicals found in or on swimmers. Urine, shampoos, conditioners, and lotions may interact with chlorine to form volatile organic compounds. These can be unhealthy when breathed, especially in indoor pool environments. Encourage swimmers to shower before swimming to remove oils, and make young and long distance swimmers to take frequent bathroom breaks to minimize using the pool to urinate. Andrew Chadeayne, a patent lawyer with a doctorate in chemistry and a former college swimmer, also wrote that there is no conclusive evidence that chlorine might cause problems. The data suggests that peeing in the pool is more harmful than the chlorine. You can read more about it in this New York Times article. It is wise to shower before and after swimming, avoid swallowing pool water and do not swim with diarrhea problems or allow diapers in the pool. The bottom line is that although they may cause eye irritation, water chemicals, such as chlorine are safe if used in the recommended amounts. Chlorine levels should be 2 to 4 parts per million at a minimum in summer months. Some people find that Bromine is a better chemical to use, particularly in warm water environments such as spas. Additionally, UV, Salt Chlorine Generators, Ozone and Mineral Sanitizers can be used to augment Chlorine as the primary sanitizer in your pool. These devices and products allow you to maintain lower overall Chlorine readings and still keep healthy swim water. According to the CDC, there are recommendations for people using and storing the chemicals that are used to treat the water. • NEVER add water to pool chemicals. 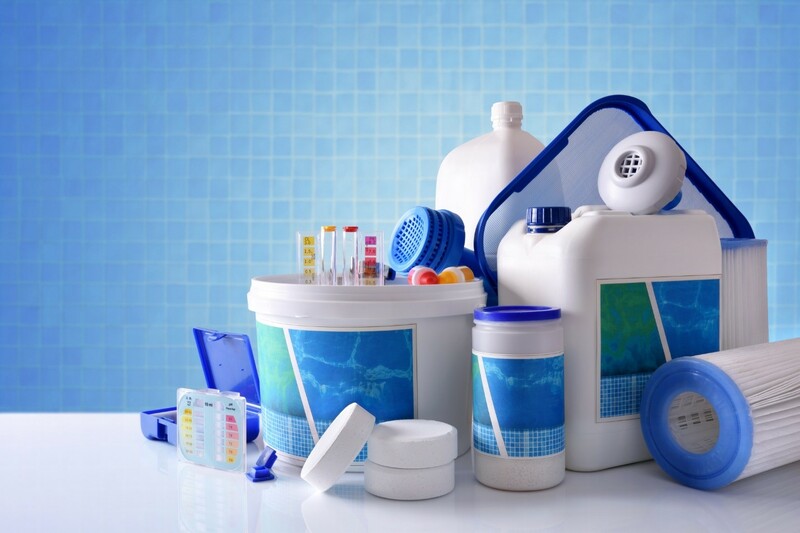 • Far more people are injured each year by handling, transporting, storing and adding pool chemicals that are hurt because of pool chemicals in water. • Even more, people are injured each year because of a lack of chemicals in pool water by harmful pathogens, viruses, and bacteria. Above all, get help if you are not trained to handle pool chemicals. This is where Pool Troopers can help you. We are thoroughly trained in using chemicals and know how to use and store them as well as what to do in emergency spills. Never mix chlorinating compounds with water before adding it to the pool. When adding a chlorinating compound to a pool wear long sleeves, eye protection and gloves and be careful when pouring or broadcasting the chemicals. Store chemicals safely and out of reach of children. Always follow the manufacturer’s instructions when using the water chemicals for your pool. There is never a good reason for a homeowner to premix your chemicals with water. Remember- Never add water to pool chemicals! A Salt chlorine generator may be used instead of adding amounts of chlorine to the pool. Buying and adding chlorine compounds are thus eliminated. Only salt needs to be added throughout the year periodically. The unit itself then “makes” chlorine by splitting the salt molecule (NACL) at the cell. This provides the advantage of creating a small amount of chlorine for your pool daily rather than a large dose once a week. Hydration of skin is another benefit of this type of system. However, the other ancillary chemicals that control pH, alkalinity, stabilizer and the pool’s water hardness will still need to be added. Pool Troopers can help you with a regularly scheduled pool chemical maintenance service. We know how to handle pool water chemicals safely and no chemicals are ever left or stored at your home. We also recommend that you find out more about salt chlorine generators as a method of effective chlorinating your pool. Contact us with your questions or to arrange for maintenance of your pool. Then relax and enjoy the water!